You are about to descend into the Lookout Creek Interpretive trail. Located within the H.J. Andrews Experimental Forest, this old-growth ecosystem is rich with many different species that depend on the unique habitat found in the temperate rainforest. The richness, diversity, and complexity of life found here are fed by cycles of nutrients, water, and the alternation between life, death, decay, and new growth. Because these cycles operate on a large time scale, research at the Andrews focuses on long-term studies and includes projects that will last for up to 200 years. The Andrews' scientists focus on how land use, natural disturbances, and climate change affect carbon dynamics, biodiversity, and hydrology. These studies enhance our understanding of this ecosystem and guide old-growth management practices around the world. Along this virtual trail, you will find seven numbered posts that describe some of the essential characteristics of an old growth forest. 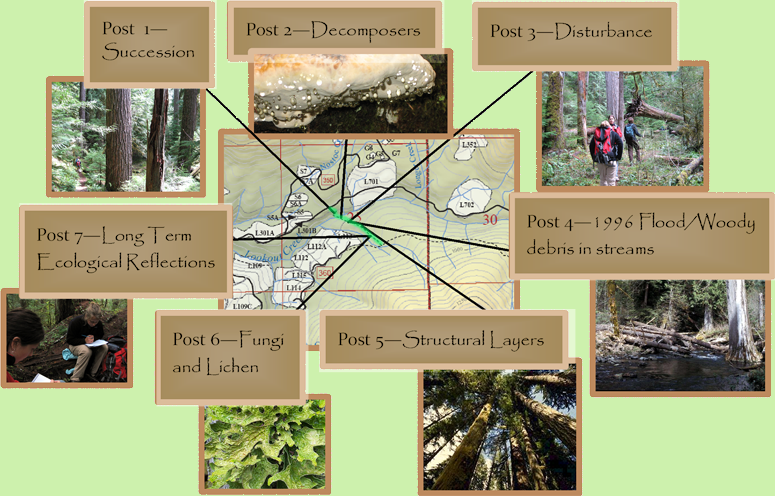 We hope you will leave with a better understanding of how the forest works and why it is so amazing. As you head out on the trail, think about what causes change in the forest. How do you think this forest is changing? Please click on the links below to enter the Lookout Creek Interpretive Trail. Start at post 1 and follow the trail through the topics. All of the posts will have pictures that have been taken along the trail to highlight the respective topics. A special feature of Posts 2, 4, and 7 are interviews with prominent researchers from the H.J. Andrews.